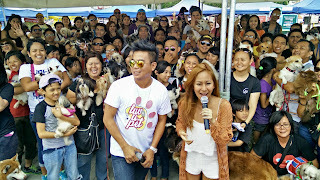 Pet lovers from all over Metro Manila and nearby provinces gathered for the grand eyeball of GMA News TV show Luv U Pet. In a rare sight, owners of dogs, cats, birds, fish, hamsters, hedgehogs, rats, piglets and exotic pets were seen altogether last Sunday (May 17) in Baywalk, Roxas Boulevard to take part in the season finale event of the only pet lifestyle show on Philippine TV. Twenty four officially registered pet groups were in complete attendance, namely: Association of Cavite Dog Lovers (ACDL), Bulacan Dog Walkers (BDW), Bulakan Bulacan Dog Walkers (BBDW), Bulakenyo Huskies (BH and Friends), Dog Owners Group Philippines (D.O.G. Ph), Philippine Fish Adoption (PFA), FURever BARKadas (FurBark), Hamster Club of the Philippines (HCP), Hedgehog Owners of the Philippines (HOP), Japanese Spitz Club of the Philippines (JSCP), Keepers of Extreme Exotics Philippines (KEEP), KutingPH, Malabon Dog Pack Club (MDPC), Mini Pinscher Lovers Philippines (MPL.ph), Philippine Bird Lovers and Trainers (PBLT), Philippine Chihuahua Club (PCC), Philippine Siberian Husky Club (PSHC), Pooch Pals Philippines (PPP), Siberian Huskies Society (SHS), SUPERDOGS of the PHILIPPINES, United Dog Lovers of Bulacan (UDLB), United Philippines Jack Russell Terrier Club (UPJRTC), Valenzuela Pack (ValPack) and Valenzuela South Alpha Dogs (VSAD). Other pet groups also participated in the event, including members from the Philippine Parrot Free Fly (PPFF) and Pet Rats Philippines (PRP). The groups are grateful to the show for organizing the event. “Feeling part talaga kami ng programa ng Luv U Pet, hindi lang kami audience (We all felt like we were part of the Luv U Pet program, that we were not just an audience),” said Jovy Gomez of ACDL. “Hindi mawawala ang energy namin lalo na kung alam namin na nagkakasama-sama sa isang event na ganito ay ‘yung mga tao na may parehong paniniwala at pagpapahalaga sa importansiya ng ating mga mahal na alaga (Our energies were high because we knew that we were with people who have the same care for our beloved pets. ),” said Redgz Falogme of BDW. “Your show really gave way to meet new people who are also pet lovers like us and exchange knowledge in handling our pets,” Therese Tenorio of BBDW added. For FurBark, it was their group’s first event participation as a dog group and they had so much fun. “Kahit mainit hindi pa din nagpatinag ang mga dumalo siyempre for the love of our pets (Despite the summer heat, all participants stayed on for the love of our pets),” said their admin Gara Edora. JCSP found it hard to organize their group and they are thankful because the event was able to encourage their members to attend. “Naging daan ang event ng Luv U Pet para maging mas excited ang mga members namin for a meet-and-greet (The Luv U Pet event paved the way for our members to be more excited to meet),” Cris Servancia happily shared. “Sobrang dami din naming natutunan kasi hindi lang sa dogs nagfocus yung event. Ang dami naming groups na nakilala (We learned so much because the event did not just focus on dogs. We were able to meet many other groups. ),” said Cherryl Roa of VSAD. They also dedicated their participation to the victims of the Valenzuela factory fire. The event also served as an avenue for other groups to promote awareness of their pets. The PFA for instance, had fun giving away fish for adoption and teaching people about proper fish keeping. “Nakakatuwa talaga kasi hindi namin inexpect na 15 new members ang nagjoin sa group namin (It is overwhelming because we did not expect 15 new members to join our group. ),” said their admin Vincent Tan. Pinoy Dog Whisperer and Luv U Pet host Lestre Zapanta led the morning’s pack walk with hundreds of dogs and dog owners. The southbound lane of Roxas Boulevard was closed for the activity. At the venue was Luv U Pet co-host Jamie Fournier who entertained the crowd as the event’s host. Together with co-presenters and sponsors, Fournier gave away freebies and prizes in several games and raffle draws during the whole event. Special guests Pia Magalona and her children Clara and Arkin also came to show support. They also brought along with them their pets Tracy (Shih Tzu) and Fifi (Poodle). Announcing the launch of Luv U Pet’s official T-shirts exclusively distributed by FrancisM Clothing Co (FMCC), Pia also gave the mechanics for their Luv U Pet T-Shirt promo where winners can get the chance to be featured in the TV show. FMCC’s Dance Crew showed some cool moves in their dance numbers. Pet owners were treated to free services like anti-rabies vaccination, grooming and doggie buffet. Lectures from veterinarians and pet product sponsors encouraged proper handling, diet and treatment of pets. The event’s major highlight was Lestre Zapanta’s dog training lecture where he gave a live demonstration to dog owners. Animal welfare organizations actively participated in the event, with Adopt a Pet Philippines (AAPP) and Island Rescue Organization (IRO) setting up a pet adoption and fundraising booth for the benefit of dog rescue centers in Cebu and Bacolod. Metro Manila’s only college of veterinary medicine, De La Salle Araneta University, along with one of its student arms Rodeo Club Araneta Chapter, served as an extended vaccination booth, water and first aid station. First aid for humans was provided for by Health Wealth. The Luv U Pet Grand Eyeball was made possible by Claire Delfin Media together with Pet Express, Merial Philippines, FrancisM Clothing Co. and EzyDog Philippines. Major sponsors are Major D Multi-Purpose Disinfectant, Bubble Bath: The pH Balanced Dog Shampoo, Yum! Yum! Dog Food, and Pets with Style Spa and Boutique. WhenInManila.com is the official media partner for this event. Highlights of this event will be shown on Luv U Pet’s first season finale this Saturday (May 23), 4:00-4:30pm on GMA News TV. Luv U Pet is produced by Claire Delfin Media.